The past century has proven that John Deere leadership is unlike any other. 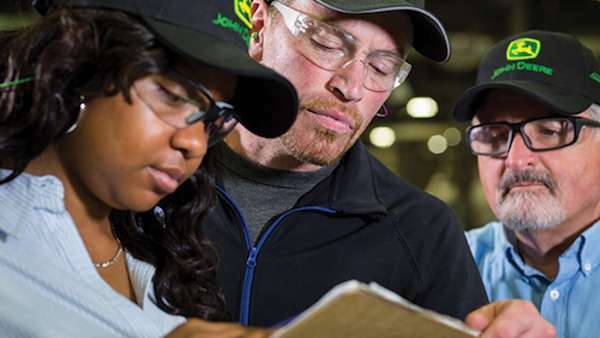 Whether they are working in the factories or within offices, John Deere employees show a great amount of pride in the work they do and are able to be successful thanks to those who have led them along the way. Relationships between leaders and employees that are built on mutual respect allow for enjoyment in the workplace that results in fulfilling the needs of the customer. Watch the videos below to hear stories focusing on the impact of John Deere leadership on the daily lives of employees. Ahmed Taha, a Product Safety and Compliance Engineer at Dubuque Works, states that his favorite part of his job is the fact that from day to day, nothing is ever the same. Providing employees with the opportunity to love what they do is a key factor within Dubuque Works’ culture, along with other important beliefs. A sense of cultural awareness, equity, and a common respect are all pieces of a bigger picture, one that John Deere leadership promotes amongst all of its employees. At John Deere, Erin Ralph sees a diverse set of customers that present various needs, meaning her employees must be ready to take on tough problems with a sense of eagerness. By taking notice of how customers are using their John Deere equipment, Erin and her team are able to extract this information and share it for further product development to continue meeting the demands of customers. Throughout her time with the company, Michele Kaiser has learned firsthand that John Deere leadership is all about promoting the success of the individual. From the very beginning, Michele quickly got the feeling that her mentors cared about her not only as an employee but also as a person, leading her to mentor her employees the same way. We hoped you enjoyed learning about the impact of John Deere leadership on the overall enthusiasm and productivity throughout the company.